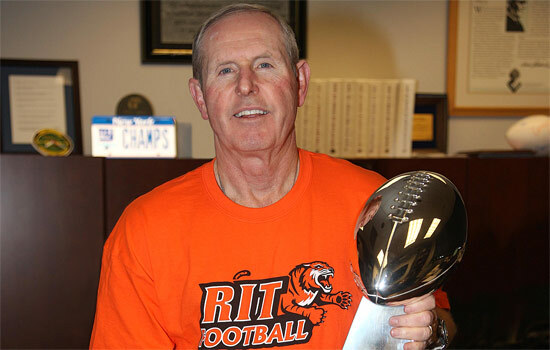 Tom Coughlin, who led the New York Giants to a victory in Super Bowl XLII, began his head coaching career at RIT. Here, donning a commemorative T-shirt created for a Feb. 3 reunion of Tigers teammates who played under him, Coughlin holds the Vince Lombardi trophy. More than 40 former members of the RIT football program gathered Feb. 3 at the Radisson Hotel on Jefferson Road. They included players and assistant coaches, athletic trainers and cheerleaders. They came from Texas, Connecticut, Rhode Island, Ohio and all over New York state—all on a moment’s notice. They were there to watch one of their own, New York Giants head coach and former RIT Tigers head football coach Tom Coughlin, reach the pinnacle of the football world. And they didn’t leave disappointed. Coughlin led the Giants to a 17-14 victory over the previously unbeaten New England Patriots in Super Bowl XLII, a win that some pundits are calling the greatest upset in Super Bowl history. As the final seconds ticked off the clock in Glendale, Ariz., the Radisson was filled with cheers and tears. “We all went crazy. There wasn’t a dry eye in the place,” says Mark McCabe, who played linebacker and defensive end for Coughlin from 1972-1973. “We all looked at each other and said, ‘From RIT to the Super Bowl.’ We were the team that he started with and we were there to celebrate it together.” Coughlin’s RIT connection made national news in the week leading up to the Super Bowl. It was featured in newspapers such as The New York Times, Newsday and Chicago Tribune. “Playing for Coughlin was a great time in my life,” says Pete Van Peursem, a Tigers defensive tackle from 1972-1975. “I’m very happy for him and very proud of him.” The day before the game, word of the RIT reunion reached Coughlin in Arizona. He took the time to answer a question about the reunion that was posed to him through a team spokesman. Coughlin was “really touched by this,” the spokesman told the Middletown, N.Y., Times Herald-Record. “Those guys played the game in its purest form,” Coughlin told him. “It was club ball going to varsity. To think that they learned some life lessons that they still practice and are passing along to their children means a lot to me. That was a special group of young men who loved the game for the game.” Hundreds of other media requests went unanswered that day. McCabe says he and his teammates were touched by Coughlin’s remarks. He plans on reaching out to Coughlin soon and sending him one of the commemorative T-shirts that RIT Athletic Director Lou Spiotti, who replaced Coughlin as RIT head football coach, had made for the event. McCabe hopes that Coughlin enjoys the shirt as much as his former teammates enjoyed cheering on their old coach. “We’re always going to remember the thrill of being with our teammates when one of the members of our team won the Super Bowl,” McCabe says.